I'm really glad I had time to bring Jeanine back to Yilan with me. She stayed in my guest room and got to try driving my scooter. 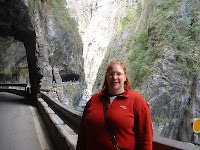 We also did a whirlwind tour of some important Taipei sites with Hope along for company.7. The Traditional Arts Center, we actually spent quite a while there and got lots of good pics, but here's a fun one. The little girl kind of just wandered into the shot, but it almost looks like she's supposed to be there. 6. Rice fields...ok maybe not a must-see, but you will undoubtedly see some! My friend Jeanine from college is teaching in Asia now, and decided to take advantage of the lunar new year holiday to hop over to Taiwan! She was my third visitor since I've been here. BTW I always welcome more! We had a great time and managed to squeeze a LOT into 3 days! But the trip started and ended with God's miraculous provision. On Friday night at about 11pm, Jeanine called me to say that there was a problem with her return ticket, and she might have to cancel the trip. We were both disappointed. She had been trying to call the airline, but couldn't find anyone who spoke English. My Taiwanese friends tend to be really impressed with my ability to make cakes and cookies. On the other hand, I'm always impressed by how they can make whipping together a multi-dish meal seem like nothing!I had a lot of fun baking with my Bible study students, from age 10-50. I taught them how to make cheese biscuits and chocolate chip cookies. Then we had a short worship and prayer time as we were waiting for the cookies to bake. We talked about how God created each one of us, and just like a cook knows every ingredient he puts into a dish, God knows every part of us. As he's making us, sometimes the mixing and shaping process is painful, but in the future, we will become something beautiful. This is the second time I've had such a large group of people over to my house, and thankfully this time didn't get in trouble with the neighbors! But I am again so thankful that I have a great apartment like this where I can host people. 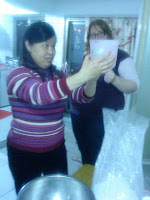 I don't have a lot of interesting things to blog about this week, but Chinese New Year is coming up! This year it falls on February 14th, Valentine's Day. Apparently that happens only once every 50 years. Next (lunar) year will be the year of the tiger.